I've been working with Coherence quite a bit over the past few weeks so I got curious about how well its distributed cache schemes compare to one another. I decided to run a quick test to check how long put() operations took when using the replicated and optimistic cache schemes. 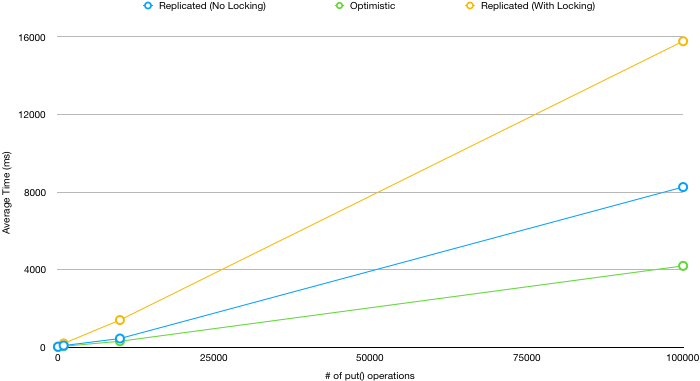 The replicated scheme (without locking) was consistently about 2x slower when compared to the optimistic scheme. However with locking it was about 4x slower. Each of the schemes scaled more or less linearly, even when locking was used on the replicated cache. Now these results are only for a single node Coherence cluster so may change as more clusters are added into the mix. This is something I plan to investigate some time in the future. These tests were run on WebLogic 12.1 with the Coherence option installed.